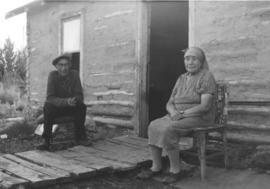 A couple at the Beardy's First Nation at Duck Lake sit in front of their house. Possibly the same man as in the four generation photo of 1994-14.2141? The log house is partially covered with plaster. Used in CM 16-3-6. 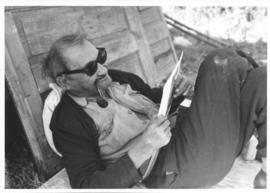 A resident of Beardy's First Nation reads a thank you letter he rec'd from MCCC for his donation of $5.00. C.f. 14.1539. 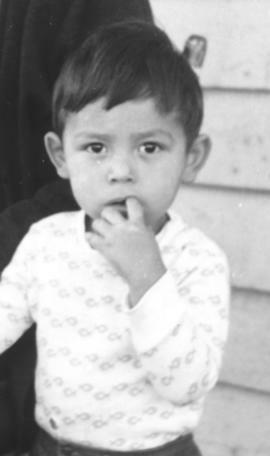 Close up of the young boy (2 years old?) in the four generation photo in 1994-14.2141? The siding of a house is in the bkgd. & he is standing with a woman wearing a black sweater. 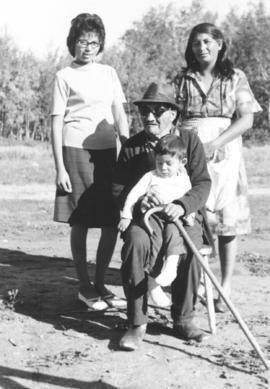 Four generations on the Beardy Indian Reservation in Duck Lake, Sask. Taken outdoors, the great-grandfather sits & holds his great-grandson (2 years old?) while mother & daughter stand behind him. C.f. 1994-14.2142 & 2143.